Dunnington extended their lead at the top of the Yorkshire Premier League with a crushing 5-0 victory at Hallamshire in round eight. With the halfway mark of the season in sight, the York club have now lead second-placed Pontefract 1 by 10, with Chapel Allerton 1 seven further adrift in thid place on 125 points. The inclusion of Guernseyman Chris Simpson, the world No 36, enabled the rest of Dunnington’s line-up to shuffle down the order, helping regulars Matthew Stephenson, Gareth Lumsdon and Julian Tomlinson pick up fairly straightforward wins. World No 62 Richie Fallows thrashed Hallamshire’s Alex Cutts and although Simpson dropped the second game 14-12 against talented 17-year-old Nick Wall, his four-game win wrapped up the clean sweep. Pontefract 1 beat Queens of Halifax 4-1. Sam Wileman and Dominic Pegg both won their first YPL matches of the season at Nos 4 and 5 and former world No 1, Commonwealth Games gold medallist Lee Beachill was an easy winner at No 3. Alex Hodgetts beat YPL debutant Daniel Smith in five games, with Queens’s only winner on the night being James Earles against Lewis Doughty. Chapel Allerton 1 captain Simon Parke, the 45-year-old former British champion, was forced to play up at No 1 against Barnsley due to the absence of Mark Fuller and Owain Taylor. 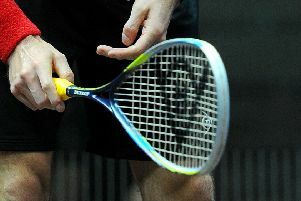 He equipped himself well against current world No 35 Declan James before losing in four games. At No 2, Egyptian Omar El Tahry lost in rapid fashion to Barnsley’s Chris Fuller. Luckily for the hosts, they had already wrapped up victory by that point with earlier victories for the lower order – youngster Ben Merchant, Declan Christie and the Kiwi, Jackson Beresford. Chapel Allerton 2 are bottom by 28 points and still without a win, but they gave Hull and East Riding a big scare. Chapel A squash secretary Ross Williamson got them off to a winning start, and Phil Young made it 2-0 with his first win of the season. However, none of the top three were able to finish the job, Niall McKinnon beaten 11-7 in the fifth by Ben Smith, while women’s world No 24 Fiona Moverley and Harry Falconer beat Adam Wellstead and Ian Chappell respectively. The mid-table clash between Pontefract 2 and Hallamshire was postponed.